Tanzania is thought to contain the world’s richest unexploited deposits of gemstones. We find these natural wonders so intriguing that we are dedicating our 5th issue to ‘Gems of Tanzania’. Throughout the last couple of months, FAS magazine has dug and collected detailed information about people, food, places and gemstones you would consider as valuable. Gems which are currently influencing culture trends and polishing their respective industries into new and precious directions. It’s impossible not to mention Jokate Mwegelo when we are talking about gems of Tanzania. A self made young woman, she has build a brand not to be reckoned with – Kidoti – encompasing an array of products from hair extensions to back packs and flip flops. Yet, she still finds lots of time to spend with youth and inspire them nation wide. She is a true Tanzanian gem. You can imagine how excited we are when she shared details about her recent trip to Turkey, courtesy of Skypalm Travel and Tours on page 14. It may just be me but I recently discovered that Kiwengwa is the most trendy part of Zanzibar island right now. From it’s clean white sandy beaches, to a vibrant art scene and night life experience. I’ll be perfectly honest with you, it’s the place to build your happiness through your own vacation beach facing property. More of that on page 11. Pantone’s colour of 2017 is ‘greenery’. When it comes to gemstones, we are looking at refreshing green hues of emerald as a popular choice, and a broad selection of some of the most stunning and trending gemstones this season (page 10). 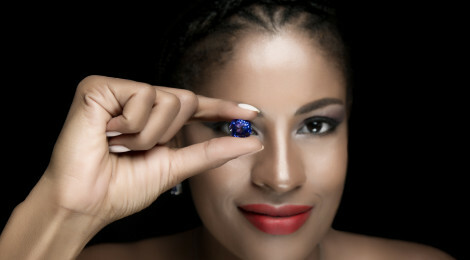 We’ll also be exploring all the sartorial ways birth stones can inspire your style on page 24. Our cover shoot was put together very fast and we are very grateful to our model Estmary Stanley and photographer Albert Manifester for being able to capture the true essence of a ‘Goal Digger’ (page 18). It seems strange that the world loves fashion yet fashion is causing a lot of waste to our planet. Thanks to Shanga (page, 30), a social enterprise in Arusha for collaborating with us with unique accessories made of recycled materials for our creative cover shoot. Everything in this issue, from food inspired by authentic heritage and histrory of Tanzania, to Isle of Jewel’s new accessories collection has a gem like value to it. With so much valuable human and material resources that we have here, I believe Tanzania has a great future, and hope this issue inspires you to keep being of value like a precious gemstone. Shine On!